I love brunch. Brunch is my jam. 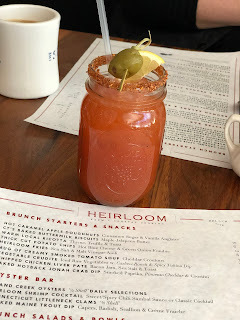 Heirloom in New Haven is located at The Study at Yale hotel and it never disappoints. What brunch is complete without cocktails?! This beauty was fabulous and yummy. 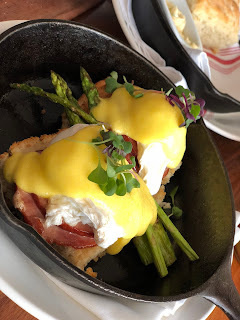 I personally prefer my Bloody Mary's with something pickled or bacon but this was yummy regardless. My counterpart enjoyed a mimosa and they serve it with a split bottle of bubbly and a teeny bit of grenadine in the bottom of the flute and it was soooo pretty. She was quick that one, too quick for me to snap a picture! When two moms get out for brunch without kids, they take advantage. We had starters at brunch. Who does that?! WE DO! 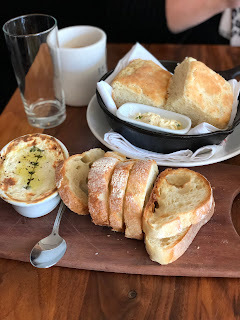 Their biscuits are homemade and served with maple jalapeno butter which was sooo good. But when you go, you MUST get the baked ricotta with rosemary and truffle. It's to die for. Shakshuka. Not gonna lie, not my jam. Or hers. But we wanted to be adventurous. It was good, really good, just not our taste. It had a kick to it and was one of the few brunch dishes that stayed hot the entire time we ate it. 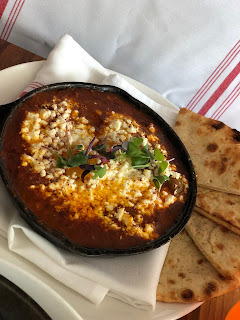 Baked eggs in a spicy tomato sauce with peppers and topped with feta. Good, just not our jam. We got two starters. We both got a main course. And what mom's brunch out would be complete without dessert too?! 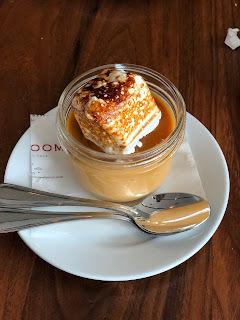 Smoked butterscotch caramel pudding topped with a toasted marshmallow. Dudes and dudettes. Amazeballs. The pudding is thick but not pot-de-creme thick. It's topped with a layer of salted caramel then this homemade toasted marshmallow that fell from heaven. Get in your car and got to Heirloom. That looks like an amazing brunch! I've never been there, but I feel like I've walked by it a million times. The dessert looks so good, and I'm quite impressed by your brunch feat.